Liverpool began their season with a disappointing result against West Bromwich Albion at the Hawthorns. Much has been made since Brendan Rodgers’ appointment about his passing philosophy, so the focus here will be upon analysing how Liverpool passed the ball against West Brom. One method of analysing passing by a football team is network analysis, which I’ve used previously to assess Liverpool’s passing against FC Gomel. The idea with network analysis is that the connections between players are analysed to look at passing patterns in the team and to identify key players in the network in terms of passing. The number of passes played and received by each player is collated according to the player they passed to and who they received from respectively. The data for passes played and received is taken from the Stats Zone application, which was kindly provided by the excellent Anfield-Index. One caveat to note is that throw-ins are included, which boosts Johnson and Kelly’s passes completed in particular. Below is the passing network for Liverpool and shows completed passes only. The larger and darker the arrow is, the greater the number of passes played by one player to another. The positions of the players are based on their average positions during the match provided by WhoScored, although Lucas and Allen are slightly separated horizontally for clarity as their average positions were practically next to each other. It is important to note that these are the average positions, which will not always be representative of where a player passed/received the ball. Also, only the starting 11 is shown as the substitutes had a fairly limited impact upon the game in terms of passing. 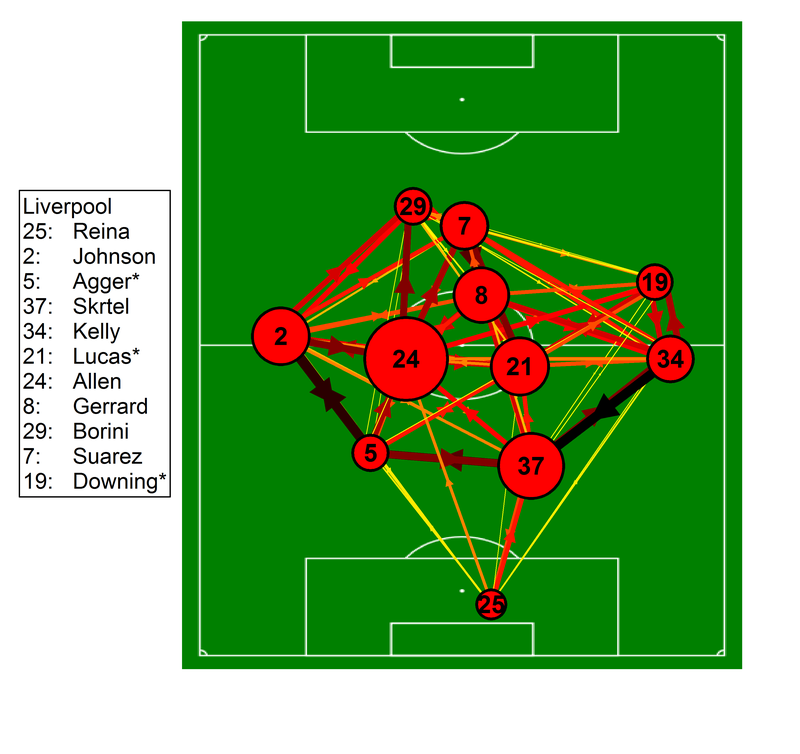 Passing network for Liverpool from the away match against West Bromwich Albion on the 18th August 2012. Only completed passes are shown. Darker and thicker arrows indicate more passes between each player. The position of each marker is based upon their average position and the size of each marker is related to their closeness centrality, which is described in the text below. Asterisk indicates players who did not play the full match. Only the starting eleven is shown. The main features in the above network are the reciprocal passes played between the defenders and the criss-crossing of passes in the midfield zone. Liverpool clearly kept the ball efficiently in deeper areas as the back four plus Lucas and Allen retained the ball well. The main issue for Liverpool was getting the ball to their attackers further up the pitch. Borini and Downing received the ball just 31 and 33 times respectively, with Downing in particular tending to pass the ball back to players in deeper areas; Downing completed a pass to Suárez twice and Borini once. Borini tended to combine with Johnson and Suárez in the main, passing to both of them on 7 occasions. Liverpool did effectively get the ball to Suárez, as he received the ball on 51 occasions and he was Liverpool’s main attacking outlet. Suárez tended to receive the ball from players in wide areas and from Lucas and Allen, whereas against Gomel the main link was with Gerrard and the quick interchanging of passes between them was less in evidence sadly. Where you gonna pass to now, where you gonna go? One of the useful tools of network analysis is that you can derive measures that indicate which players in the team are the most influential in terms of passing. One of these measures is known as “closeness centrality”, which in this context is dictated by the number of passes played and received by a given player. The key aspect of this measure is that it is greater when the passes that the player plays and receives are distributed more evenly across the team. If a hypothetical player makes 100 passes in a match and receives the ball 100 times, they would have a greater closeness centrality if they passed and received the ball 10 times to and from each team-mate compared to if they simply passed the ball back and forth to just 1 team-mate. Players with a larger closeness centrality score are interpreted as being a greater influence upon the passing of the team as they dictate the movement of the ball within the side. In the figure above, the size of the player markers is dictated by their closeness centrality score. Joe Allen was Liverpool’s stand out player as he dictated Liverpool’s passing play. He generally received the ball from his centre-backs and Johnson prior to playing his passes. He linked well with Johnson and Borini on the left, his midfield partner Lucas and Suárez further forward. A feature of Allen’s play was his movement to make himself available for a pass and he received a pass on 62 occasions, more than any other player. Skrtel had the next highest closeness score, although he was some way behind Allen. Agger was far less effective compared to the Gomel match, partly due to the sending off but also due to his passing recipients being lesser in scope as he favoured passes to Johnson, Skrtel and Allen. Lucas was also less of an influence, again partly due to not playing the full game but also due to being less central to the teams passing. Johnson was more effective than Kelly from full-back and was probably Liverpool’s most influential attacking force as he played high up the pitch on the left and created 3 scoring opportunities according to the EPL-Index Stats Centre. Downing and Borini’s involvement was very limited compared to their team-mates (only Reina was less involved). The involvement of Suárez and Gerrard was also disappointing. Overall, the lack of involvement of Liverpool’s front-4 was a hindrance over the course of the match, as most of the play was contained in the defensive and midfield zones. Liverpool’s passing against West Brom was reasonable, particularly in the 1st half and there were definite signs of Brendan Rodgers’ philosophy bedding in. However, the lack of involvement of the front-4 and in particular, Borini and Downing was disappointing. The major bright spot was the performance of Joe Allen, who dictated the passing play of the team to good effect. Unfortunately, Lucas wasn’t up to his usual level, which may be due to his ongoing recovery from injury and also this match being the first time he started with Allen. Hopefully future games will see this partnership blossoming as they begin to complement each other in terms of their roles within the team. Such a partnership could be crucial in implementing the control that Brendan Rodgers desires. This entry was posted in English Premier League, Liverpool, Network Analysis, Passing and tagged EPL, Liverpool, Passing, West Bromwich Albion by Will Gurpinar-Morgan. Bookmark the permalink.